Broadcasting fertilizer requires mechanical incorporation across the entire field otherwise there can be nitrogen losses to volatility from urea-based fertilizer sources or losses to wind or water. While this method creates a nutrient-rich zone a few inches below the soil surface, application can be non-uniform, and the loss of crop residue increases the soil erosion and concentration risk. This University of Minnesota Extension article titled Banding Fertilizer with the Corn Seed is a great resource for determining the salt index of blended fertilizers. 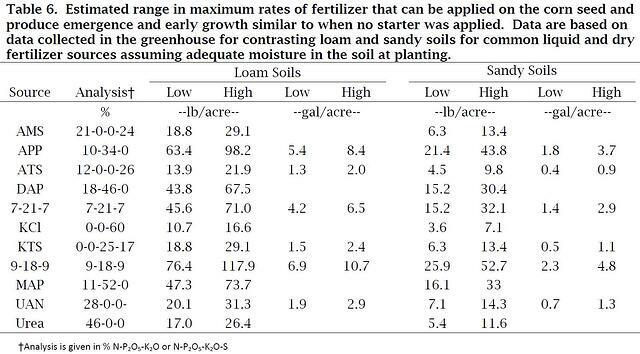 Table 6 shows the estimated range in maximum rates of fertilizers that can be applied on the corn seed while producing emergence and early growth similar to when no starter was applied. This resource accounts for soil texture as well. In general for corn, the recommendation is to limit the amount of N and K20 in contact with the seed to no more than 10 lbs/acre. The following example looks at the 100 lbs/acre of nitrogen applied in a band on 30” centers versus incorporating that same 100 lbs/acre of nitrogen in a 10”x3” zone. 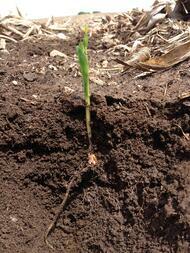 100 lbs/acre of N applied in a band on 30” centers would yield a nitrogen concentration of 12,400 ppm. That same 100 lbs/acre of N broadcast and incorporated to a 3” depth would yield a N concentration of 110 ppm. Based on these figures, if 10 lbs. of N + K2O is the upper limit in a banded application on the seed, the upper limit when uniformly distributed in the strip-tilled “zone” would be closer to 375 lbs. total N, K, and S.
The dual coulter design of the SoilWarrior® X row unit likely provides the most uniform distribution of nutrients throughout the tilled zone, vertically and horizontally.